Many thanks for telling such a well told story. Much appreciated. First thing to say is this is a very hard one to identify, but let's not give up too soon. It's hard because the crown marking is the most commonly used device of them all. Companies large and small, well known and little known use a crown back stamp of one type or other. So we are truly looking for a needle in a haystack. Having said that, there are certain clues we can try to concentrate on. The first clue is the style of the markings. They are the type of marking used in the late 19th and early 20th century - mainly in Germany and England - and it seems as if it should be quite a well established factory. However, I had no luck finding this exact impressed crown mark, despite looking through five different books and doing some pretty advanced Google-fu. Second thing to look again at is the marking itself. It appears there might be a part of the impressed mark, underneath the crown which didn't come out in the pressing. I can't see it from the photo, but maybe you can take a closer look or take a rubbing. Once you do this, we can have another look. The third clue is the shape and detailing of the crown. Not too many makers have used this slightly flattened shape of crown. Only about half a dozen. 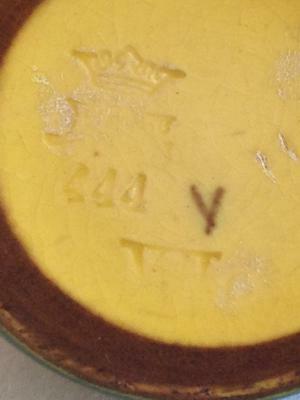 For instance, in the 1920's Crown Ducal of Staffordshire used almost this exact shape and style crown on one of their standard marks - almost the same in every detail . . . They are not shown in the records to have ever used an impressed crown that I could find. 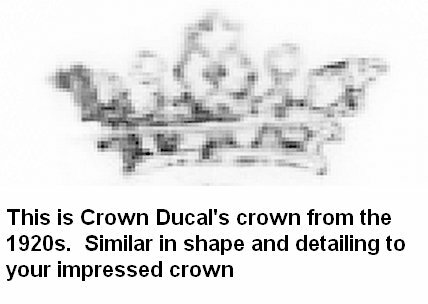 They are all black printed marks with this crown shape and have ‘Crown Ducal’ clearly written underneath. 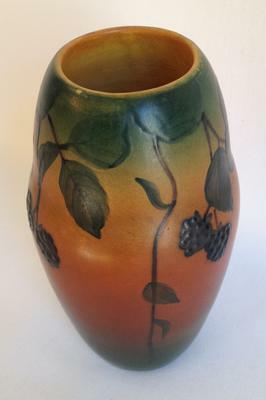 Crown Ducal did, however, make earthenware art vases of this nature in the 1920's, I believe. I could not find any examples with this mark on it, but as they say, absence of evidence is not evidence of absence. It is possible that Crown Ducal are still in business in Staffordshire. If so, can anyone reading this from the firm please get in touch. There we are so far. Let’s hope to solve this one!